solutions including CNC controls and automation systems. 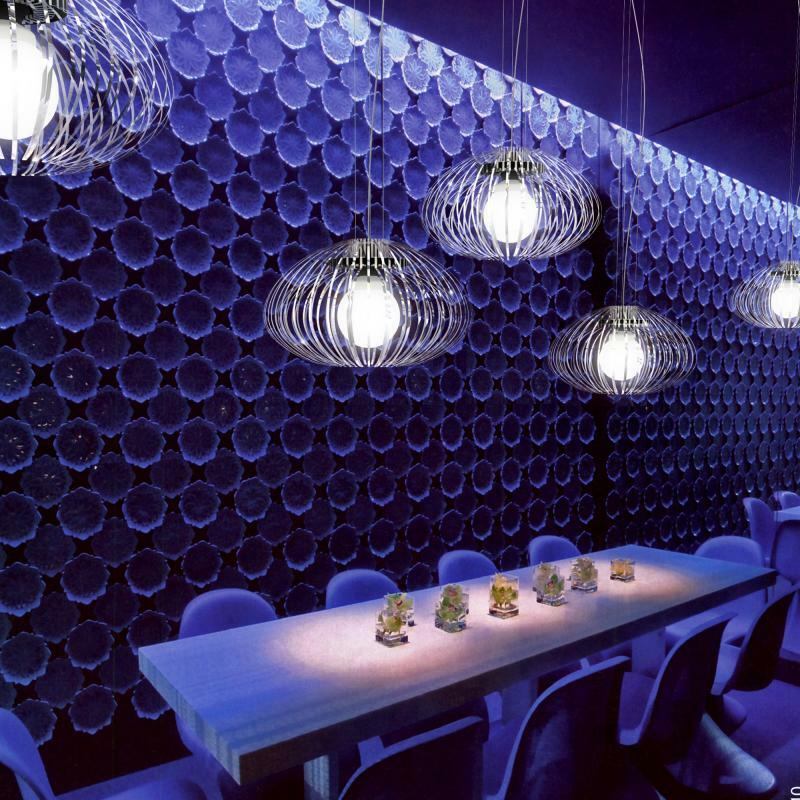 Yellow Goat Design manufactures and collaborates with architects and designers to create specialty lighting fixtures, decorative room dividers for malls, casinos and commercial buildings. Initially Mike Collins and Nick Lesko, President, were outsourcing their laser cutting but with delayed lead times and poor quality of cut parts, they knew something needed to change. Lesko and Collins decided that a CO2 laser was truly what they needed. Lesko said, "Initially, we looked at laser because of the polished edge we needed to achieve with our acrylic. The laser cuts acrylic and it looks like it's already flame polished". Lesko and Collins visited the Chicago Technology Center where they took pieces they had already been cutting, 1/2 mm mirror polished aluminum, to put the OPTIPLEX NEXUS to the test. "It's a difficult material to cut because it has a reflective mirror finish on one side, but the Mazak machine did it with ease," stated Collins. Their search ended when they found the OPTIPLEX NEXUS 2.5kW CO2 laser cutting machine. 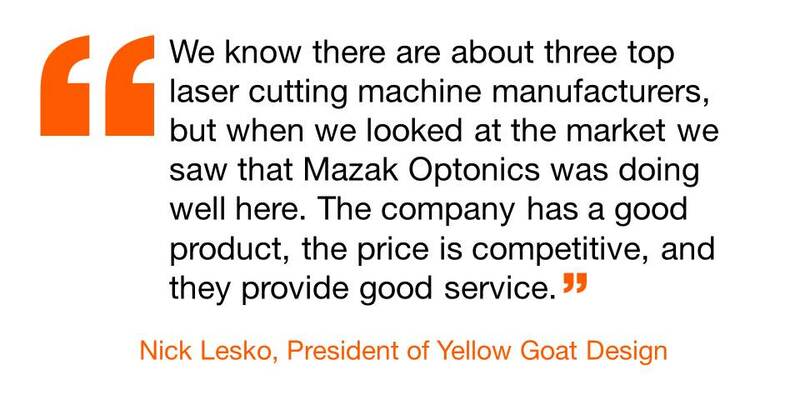 Lesko explained, "We know there are about three top laser cutting machine manufacturers, but when we looked at the market we saw that Mazak Optonics was doing well here. The company has a good product, the price is competitive, and they provide good service". Yellow Goat Design was able to bring their laser cutting in house allowing them to have control over quality. This also allowed them to speed up production instead of waiting on another company to cut their parts. Mazak Optonics Corporation is a major supplier of laser-cutting systems, offering 50 laser models and leading the industry in the implementation of emerging laser technologies. The company’s 50,000 sq. ft. North American Headquarters are located in Elgin, Illinois, and feature a 30,000 sq. ft. laser technology center housing up to 18 machines for demonstrations and training. Mazak Optonics is part of Yamazaki Mazak Corporation (Oguchi, Japan), the global leader for the manufacture of machine tools and systems for the precision machining of metal parts, including CNC turning centers, horizontal and vertical machining centers, Multi-Tasking machining centers, turnkey cells and software solutions. The North American Headquarters for Yamazaki Mazak are located in Florence, Kentucky. For more information on Mazak Optonics’ products and solutions, visit www.mazakoptonics.com, email sales@mazaklaser.com or call 847.252.4500. Copyright © 2016 Mazak Optonics Corporation. All rights reserved. Products and specifications subject to change without notice. Copyright © 2017 Mazak Optonics Corporation. All rights reserved. Products and specifications subject to change without notice.